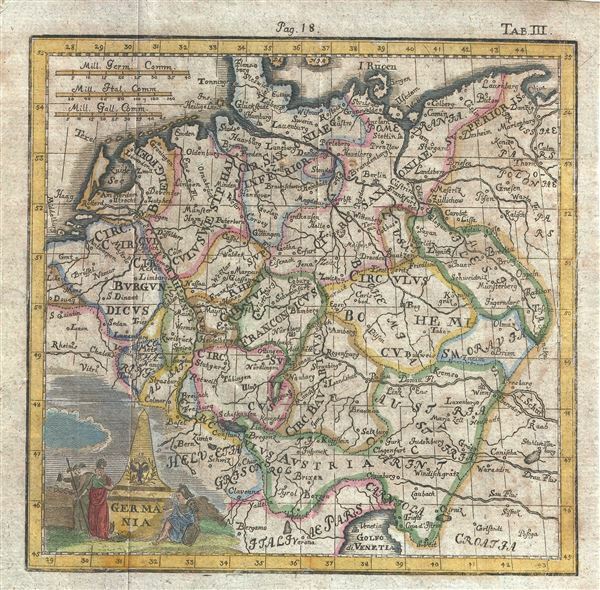 A scarce 1742 miniature map of greater Germany by German historian Benjamin Hederichs. This map covers the entirety of those lands traditionally occupied by Germanic peoples, from the Blatic Coast to the Gulf of Venice and from Holland and Belgium to Poland. Numerous place names noted. Decorative allegorical title cartouche in the lower left quadrant. Published for Hederichs 1742 Anleitung zu den fürnehmsten historischen.